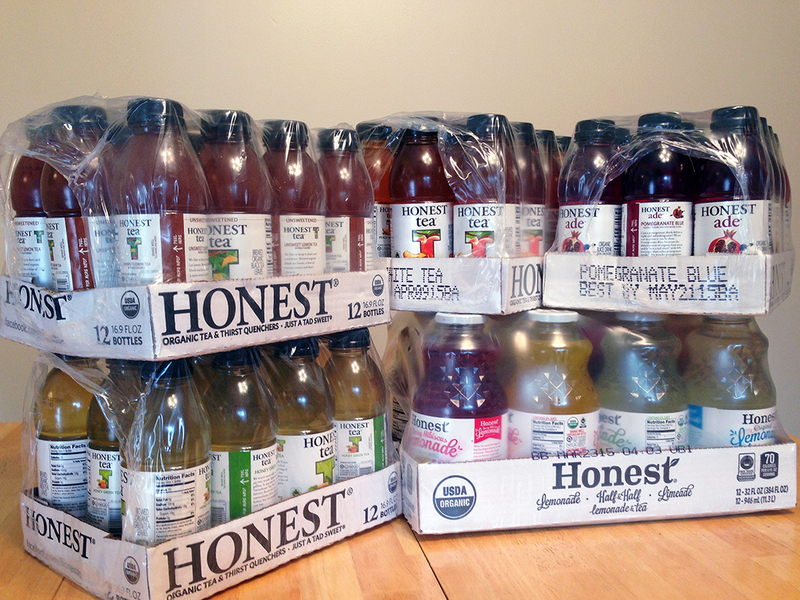 A representative for Honest Tea contacted me to see if I was interested in trying some of their products. Not one to shy away from free samples, I agreed to write up an independent review of my experience. A quick read of the label on many of the Honest Tea Company products reveals that the ingredients are mostly organic fair trade, with ascorbic and citric acid being the most chemical sounding ingredients. The company’s story is also really interesting because it pairs a student, Seth Goldman, with his Yale Professor, Barry Nalebuff, who partnered to create an alternative beverage that could quench thirst without excess sugar. Shortly after I was contacted, I arrived home and found a delivery waiting for me. What they sent me was nothing short of a small convenience store supply of beverages. This extremely generous sample of their products not only quenched my thirst for an entire Summer, but also that of numerous friends and family. As part of the package, I got to try NINE different Honest Tea products (including one that has been discontinued) and that isn’t even every kind of beverage they make! Honey Green Tea – The first tea I tried from the bunch was the Honey Green Tea. I’ve always been partial to green tea because of its mild flavor and high caffeine content. I expected either a really bland beverage or one that tasted so artificial that the most green tea like aspect would be its color. Instead, the tea tasted really light as green tea should, but with all of the right earthy notes. The honey that sweetened the tea really stood out, but it wasn’t especially sweet either. The result was a surprisingly well-balanced and refreshing drink! Peach Tea – After the Green Tea, I assumed that it would be the best of the tea choices. As it turns out, I liked the Peach Tea equally (or maybe even a little better) than the Green Tea. It too was very light in flavor, but the peach flavor shone through. The tea wasn’t too sweet, but instead offered just enough sweetness to highlight the fruit flavor and take the edge off of the tea. P omegranate Blue Tea – Of all the teas I tried, this was easily the sweetest and most strongly flavored. It had strong notes of pomegranate, blueberry, and grape flavors, which overpowered the tea a bit. Compared to the influence of the juice, the tea’s contribution seemed to merely make the juice lighter. Personally, the combination of pomegranate and blueberry juices never really made it to the top of my list of really great flavor combinations. Nonetheless, I could see people enjoying this if the other Honest Tea beverages seemed a little too light. Unsweetened Lemon Tea – For people looking for real tea flavor that is only accentuated by a hint of lemon, then this tea is for you. When the label says that this is unsweetened, that is exactly what it means. It’s a little jarring at first when you lift a bottled, non-water, beverage to your lips and taste no sugar. Even so, the drink is pretty refreshing. The other great thing about the unsweetened tea is that if you want, you can sweeten it yourself with whatever you want. I tried using my Pumpkin Spice Simple Syrup and the results were nothing short of awesome. Highly recommended! Lemonade -This is the base model or flag ship for the rest of Honest Tea’s Summer Refreshers. The lemonade is very good while remaining light in flavor and light on sugar. The lemon flavor is present, but not too sour. Overall, this is just a solid refreshing drink. Mint Limeade – I didn’t think I would enjoy this combination of mint and lime, but I really did. Again, like all of Honest Tea’s beverages, the flavors were really light. The lime is the first thing you taste, which is then followed by a minty finish. The mint tastes like natural spearmint, so it is mild and cool rather than fiery like some artificial flavors. Half and Half – The half lemonade and half tea mix is more famously knows as the Arnold Palmer, but I never thought of it as delicious until I tried Honest Tea’s version. Perhaps it is once again due to the reigned in sweetness of the Honest Tea brand in general, but this balance of lemonade and tea just hits the mark. It actually is relatively sweet, but not sickeningly so. The sweetness comes more from the lemonade and the tea helps to round out the fruit flavor with the earthy tea flavor. Excellent! Mango Lemonade – I doled out this mango and lemonade combination to guests interested in a more juice-like beverage. Honest Tea’s mango lemonade isn’t as thick as juice and not as sweet, but it still delivers on those tropical flavors. I thought that this was a great way to feel like you were drinking juice without actually drinking the sugary syrup that we have come to think of as juice. Berry Hibiscus Lemonade [Discontinued] – Last, but not least, I got to try the Berry Hibiscus Lemonade, which I really thoroughly enjoyed. The United States really under-utilizes hibiscus and this beverage blended it really well with the milder berry flavor. Hibiscus’ naturally tart profile complemented the lemonade, while the berry mellowed it all out. It’s a shame that this one lemonade was discontinued. Perhaps the American palate isn’t quite mature enough for the wonders of hibiscus.